I must confess, when I first heard about omics, I didn’t grasp it. It seemed complicated, but I assure you that it is far from it! Omics is an exciting and relatively new field that involves studying genomes, proteomes, metabolomes, etc. Before we go further, let’s break this definition down further. -Ome means ‘all constituents’. Therefore, genome (gene + ome) means all genes in an organism. Similarly, proteome is all proteins and metabolome is all metabolites in an organism. Omics is the study of these -omes. 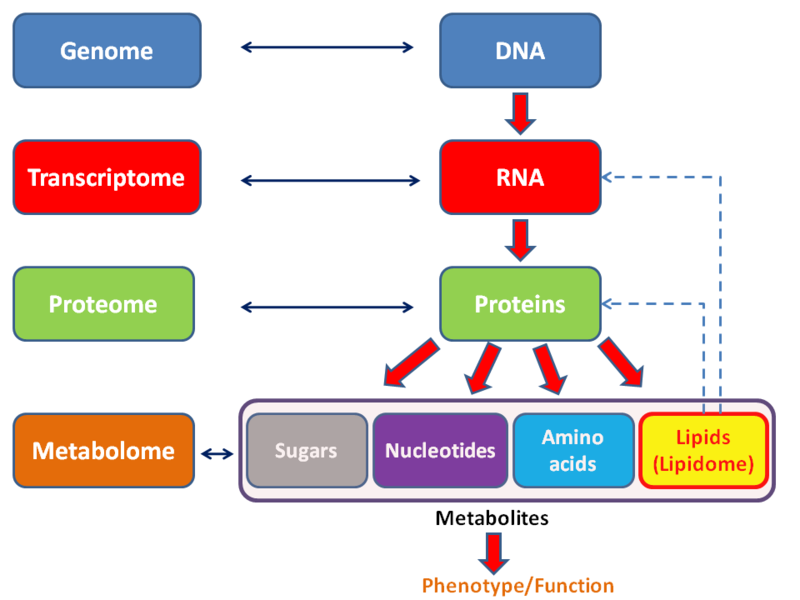 There are other -omics like transcriptomics (study of transcriptome or all RNA transcripts/molecules) and lipidomics (study of lipidome or all lipids). If you are unsure what these specific omes mean or how they are produced, please check the figure below. Now let’s get into why this field is exciting and why it is important for Tox21. Because studying one or few genes or proteins is not going to provide us with a lot of information. Instead if we look at the effects of a chemical on an entire set of genes/proteins, we can be more confident about the chemical’s effects on the organism and also account for interactions (example: how change in one protein level changes the level of another protein). Also the -omics technology focuses on the important molecules. We all know DNA is important and can tell a lot about an organism. However, in toxicology, proteins and metabolites are more important as they can change characteristics of an individual (a modified DNA can often cause no observable change), and thus indicate if the exposed individual will be negatively affected. Why is -omics important for Tox21? We can take a cell or a tissue sample from a species and, in the lab, check how a chemical modifies the presence or level of different molecules in the species. The results can help determine if the chemical will be safe or harmful to the species without doing any whole animal studies. How is -omics carried out? Let’s say we want to study RNA transcripts. One way to do this is to collect cells/tissues from a species and divide it into two samples. Treat one sample with a chemical and leave the other sample untreated. Then isolate all the RNA transcripts from both samples and convert it into its corresponding DNA. Tag the DNA from both samples with different colors and combine them on a chip or plate called a microarray. The DNA will bind to molecules in the microarray and emit light. If the light emitted is the tag color of the treated DNA, it means the treated cells have a different RNA or greater quantities of an RNA compared to untreated cells. Similarly, if the light emitted is the tag color of the untreated DNA, it means the untreated cells have a different RNA or greater quantities of an RNA compared to treated cells. If both cells have the same RNA in similar amounts, the light emitted will be different from the color of either tags (see Figure 2; cancerous cells correspond to treated cells). Since different RNAs produce different proteins, we can therefore use this technology to study how the characteristics of a species would be altered by the chemical. In mammals, there are approximately 25,000 genes, 100,000 RNA transcripts, 1,000,000 proteins and 5000-7000 metabolites. Therefore, this technology involves studying a lot of molecules and interpreting a lot of data, neither of which is easy. To make matters worse, while metabolomics seems the way to go, there is little consensus on metabolite data. The data obtained so far have a lot of artifacts, quality control issues, misidentified metabolites, outliers, etc. Also, extraction of all metabolites from a sample is difficult and the results are not always relevant. The most standardized technology is transcriptomics. Yet there is little consistency between labs and there is a lot of noise. Microarrays cannot measure how much RNA is produced and often, the data obtained cannot be interpreted to explain how the organism/species might be affected. Finally, -omics technologies are expensive. We need further innovation and quality control before we can routinely use them to solve the effects of chemical exposure.